Based on the Big Red Boat from the new CBeebies show, Twirlywoos. Combines developmental learning with imaginative play with fun sounds, songs, flashing lights and activities galore! The Big Red Activity Boat has been cleverly designed to combine developmental learning with imaginative play with fun sounds, songs, flashing lights and activities galore! The pull along feature will help to strengthen children's legs and aid their overall balance. Learning elements within the Big Red Boat reflect the educational content of the show itself, providing children with reinforcement through simple word learning. Great BigHoo and Peekaboo figurines are included and are the perfect size for little hands to grasp, these colourful figurines will help children to develop fine motor skills whilst encouraging them to use their imagination through pretend play. Fun features include… • The side of boat opens to reveal a play area with decoration inside. • The iconic Fruit Tea Machine - push the pedal to see the fruit tea rise, helping children to understand cause and effect. This feature is also supported with key learning words such as Up, Down, Empty and Full. • Spinning drum - includes character images for recognition, fun sounds and character phrases. • Turn the wheel on the back of funnel to hear fun bird sounds and watch as they spin on the boat's mast, promoting hand to eye co-ordination. The fun sounds will help to stimulate senses too! • Place Peekaboo in the fun hideaway - helping to develop fine motor skills • Pull ring to hear 1 of 3 Twirlywoos tunes for added fun! 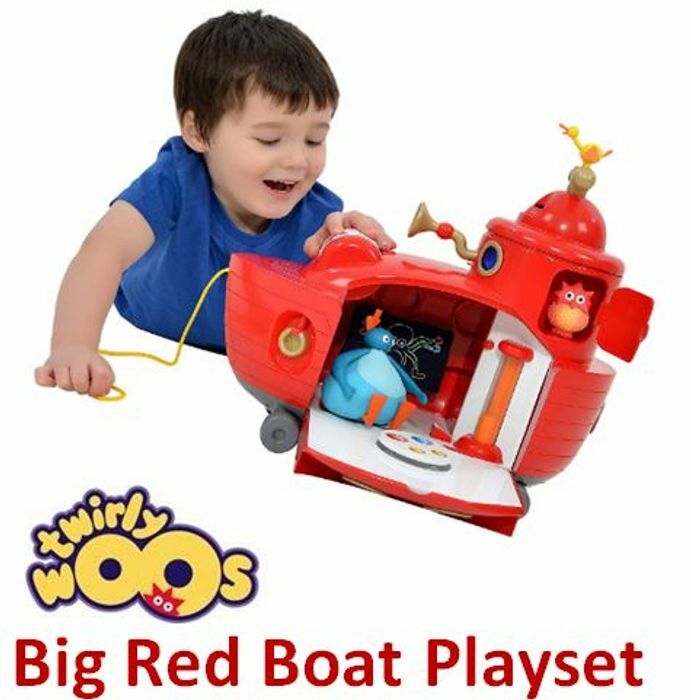 The Big Red Boat Playset will provide little ones with hours of Twirlywoos fun whilst being introduced to simple word learning and encouraging little ones to use their imagination through pretend play.